4 gallons of solid ice to keep cool on yet another hot day. It was down to a half gallon ball at the end of the day. We were pretty excited to get back on the track. The kart was a little banged up from the last race, but that was all fixed. This week we were running a little late but were happy to see the gate was already open when we arrived at Road Amerca. 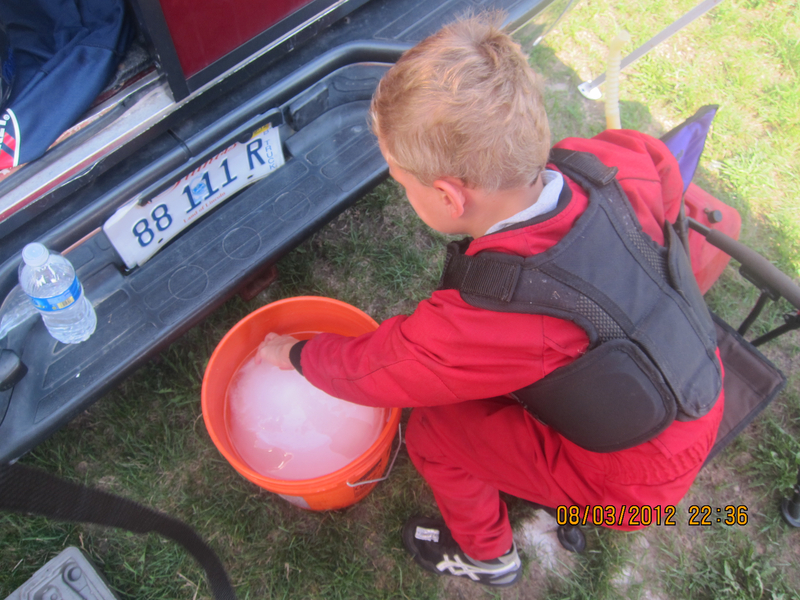 This made it easier to get the kart ready for the first practice of the morning. You really need to be on the ball. Usually, the gates open at 9am and practice starts at 9:15. In that 15 minutes you need to register, get to the track, get the driver and the kart ready and get to the line. Most of the time, Jason is the only one ready for practice and he gets the track to himself. This week we had a bit more to do because I wanted to try out the taller skinny wheels and see if they made a difference. 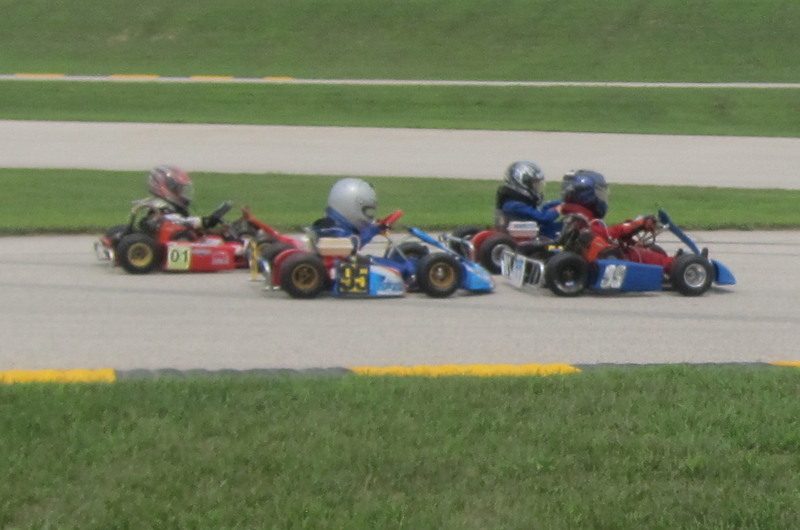 Since the rules don’t allow us to change gears most kid karts run narrow wheels with really high pressure on the rear. This makes the tire taller and acts like a gear change. The kart should go farther with every wheel rotation, increasing his top speed. The down side is that the tire track interface is smaller and can make cornering trickier as the rear tires are more prone to slipping sideways. Practice went well. Jason had one 29 second lap and the rest were in the thirties and thirty ones. I was really hoping to see some more obvious improvement. I suppose he might be going faster in the straights, but he is still letting off the gas too much in the corners. During the last practice on the last lap he and Brice (#14, a newer driver) got tangled up in the last corner. Jason ended up facing the wrong direction but managed to break himself free and turned around to cross the line first. Our racing goal of the day was to keep it clean and finish the race and work on the racing line. For the first heat start, Jason anticipated the flag a little and led the group in to the first corner. 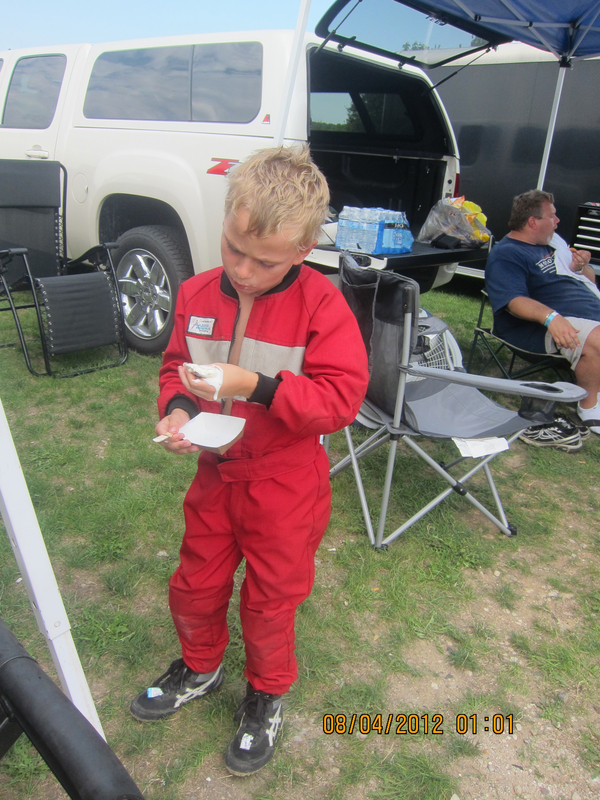 He was able to lap #95 (Emery, who just turned 5) and Tristan (#1 who races a Briggs 206). Brice was kept back buy the occasional spin, but was able to stay on the lead lap. Jason kept a clean line and finished first. Pace lap just before the hat top. The second heat was went as well as the first heat 1. Jason walked away from the pack and lapped the two younger kids while Brice was still slipping around the corners. I spent my time cheering for the other kids’ great moves while keeping on eye on Jason. It’s a blast to watch these kids find and and sometimes cross the threshold of maximum speed, though it makes me nervous when they do it too much. Every lap someone learns something new and there are almost always big grins at the end. The starting line is in the middle of the long straight. The feature was a real battle of drivers. Both Jason and Brice have sections of the track they do very well and other sections they have trouble with. Jason is very good in the last corner to the front straight to the top of the hat when he starts to lose the line. Brice runs the end of the first corner over the top very well. The two of them fought each other back and forth through the whole race while lapping the others twice. Then they got stuck behind the slower traffic. Tristan could not get by Emery, Jason could not get by Tristan, and Brice kept trying to make a move on Jason. The white flag was flying and all they needed to do was hold the line to the finish. Brice really wanted to pass Jason and made a final attempt in the hat as Jason was letting off to exit to top corner. They were side by side in the exit and were trading paint when Jason gave the gas to get away and Brice pulled behind him for the penultimate corner. They both made a final run for the checkered flag in the last corner. 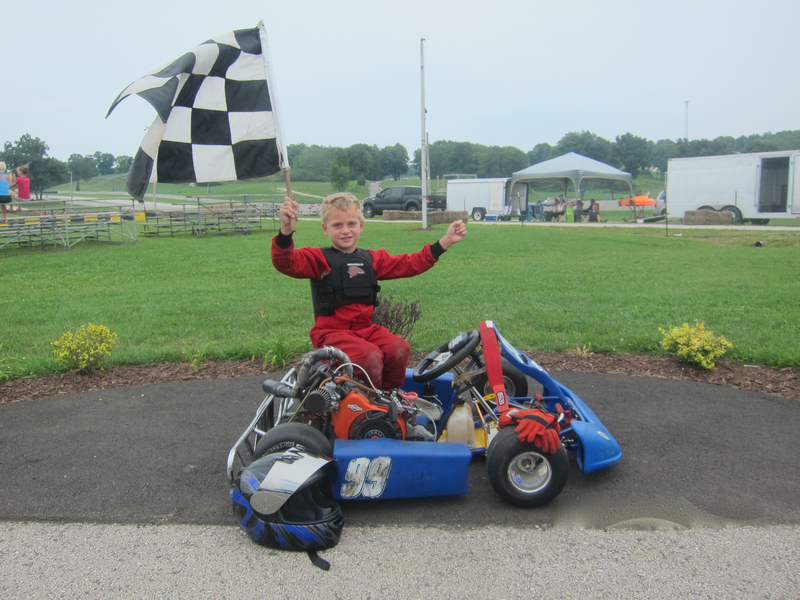 Jason captured the feature win by a kart length or two and a mighty fist pump. Jason and I are looking forward to our next race, though it is going to be a few weeks as we have other plans. Hopefully everyone will show up and we can have more karts on the track. The more races out there the more interesting the racing and opportunity for learning new tricks. Thanks again to VKP for get the kart sorted in short order. Mike for the ice cream for Jason. Most importantly my spectacular wife who lets me do this.